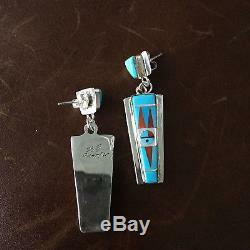 Sterling Silver Kingman Turquoise Inlay with Native Design Dangle Earrings. 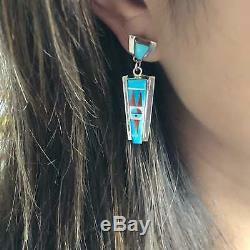 Stone: This beautiful set of Sterling Silver earrings features a Native design mixing Kingman Turquoise with Mother of Pearl, Black Onyx, and Red Coral. 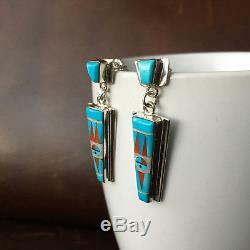 Kingman turquoise is famous for having various sky blue color with characteristic veining. The Kingman Turquoise Mine, located in Kingman, Arizona, is one of only three prehistoric mining sites in Arizona. 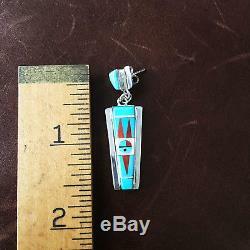 It's discovered and mined by prehistoric Navajo Indians well over 1000 years ago. The Colbaugh family has owned and operated Kingman since the 1880s and is credited for discovering this ancient mine as well as the Hohokam hammers left behind by the Navajo Indians. 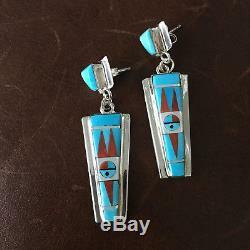 The "high blue" color of Kingman turquoise has become a standard in the industry and has made them some of the most valuable turquoise in the world. Artist: Raylan & Patty Edaakie My Philosophy: I choose every piece of jewelry based on the value of the stone. Unlike most of the Turquoise on the market, the stone has to be high quality (not stabilized, not color treated and not reconstituted).